In Kenya, women are actively discouraged from taking traditionally “male” roles such as construction, but Annastaciah wouldn’t be deterred from her desire to work. She left her home in Machakos Country in eastern Kenya to come to Nairobi, where she believed the construction boom might help her overcome the discrimination she faced from her male peers. Annastaciah was selected as a trainee from our TVET on Wheels programme funded by our partner, the Housing Finance Foundation. Annastachia was one of just four women in the inaugural TVET on Wheels class. She quickly proved that she could perform with the best, graduating second in her class of 25. Equipped with her newly earned internationally recognised certificate and properly registered with the Kenya National ConstructAuthority, Annastachiah was quickly recruited at a nearby site as a helper Mason, more than doubling her hourly wage as an unskilled laborer. 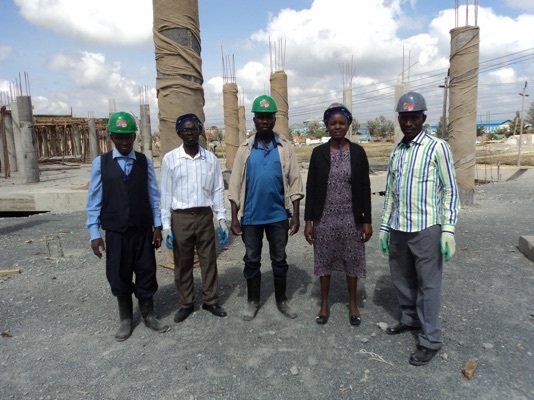 Annastachiah continued to work her way up the ladder, recently landing a job as the Clerk of Works at a small contraction project in Kiambu County, central Kenya. She earns an excellent wage allowing her to send her young daughter to primary school, where she can gain a better education and have great job prospects of her own. Born and raised in Kangemi slums in western Nairobi, Edwin has always been a determined and driven young man who was willing to work hard to raise his prospects. He became an unskilled laborer in Kitengela, north Nairobi where he earned $4 a day. Edwin continued to look for ways to improve his position, securing a place in our TVET on Wheels class funded by our partner, Global Communities Kenya. From the very beginning, Edwin’s trainers believed he would excel in the programme, and he didn’t disappoint them. Graduating at the top of his class. 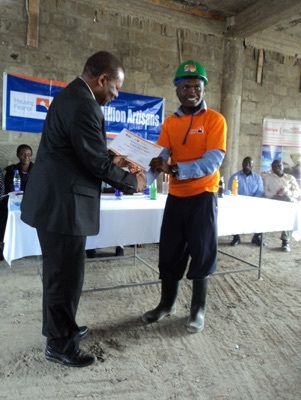 Edwin earned an internationally recognized certificate with Arc Skills that allowed him to seek registration with the Kenya National Construction Authority. Now a registered artisan, Edwin coupled his newly acquired skills with his natural acumen for business, setting up a construction consultancy in his hometown. Edwin currently advises builders and oversees projects within the community, emphasising previously neglected areas, such as health and safety whichhe learned through the Arc Skills programme. With Arc Skills training, Edwin isn’t only improving his life; he is also raiding his young family and giving back to the community where he was raised.